No, my post title has nothing to do with a Hispanic translation of the old Super Friends cartoon. It's a reference to a 2007 documentary called, obviously, Super Amigos. It's about five men who, independent of one another, don costumes reminiscent of Mexican wrestlers and pursue social justice in and around Mexico City. 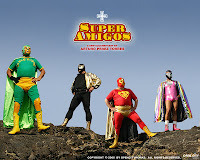 Super Animal fights for animal rights, particularly working against bullfighters. Ecologista Universal fights on various ecological fronts. Super Barrio helps tenants of poor neighborhoods who are getting unfairly evicted. Fray Tormenta helps impoverished children. Super Gay fights for LGBT rights. They all take different approaches to fighting injustices, from Super Animals more direct and aggressive techniques to Super Barrio's more inspirational and motivational approach. It's not surprising that real life superheroes would show up in countries besides the United States. Phoenix Jones doesn't have a lock on the idea, after all. But what's immediately striking, to me at any rate, is the different direction these Mexican heroes take. They're still referred to as superheroes (though, notably, not by themselves) but take their visual cues from wrestling rather than "typical" costumed heroes. Wrestling, of course, is a larger part of Mexico's cultural heritage compared to superheroes (and comics in general, for that matter) so it makes sense that their frame of reference is a little different than here in the U.S. But what's also note-worthy is that they're all tackling issues on a larger scale. These aren't costumed vigilantes prowling the streets to break up bar fights and muggings; they're trying to affect social change. Not only that, they're trying to do so by helping to empower others to fight with them. They're not trying to be lone warriors, individually helping one or two people at a time. They're trying to raise armies to push society on the whole in a certain direction. I think that says quite a lot about the differences between Mexican and U.S. cultures. Here in the States, we often pride ourselves on our "rugged individualism" but that also makes it more difficult to push to reform larger issues because we're all being individualistic, instead of joining forces to combat a larger enemy. Now, I would argue that some of these Lucha Libre style heroes are astonishingly ineffective. Ecologista Universal in particular has good intentions, but doesn't really get it. For example, when he buys groceries at the store, he doesn't leave until he's removed all the packaging so it doesn't go into a landfill. Except that it's still going to go in a landfill, regardless of where he leaves the packaging. He might not be putting in HIS garbage can, but it's going into somebody's. Also, I have to wonder about the environmental impact a full-length cape covered in plastic sequins had. His one "victory" is that Mexico City is now behind Cairo as "most polluted city" but I'm pretty sure that has more to do with Cairo getting worse, not Mexico City getting better. The Super Amigos documentary is a little hokey, with periodic "Meanwhile"s and "Across town"s and animated "origin" sequences, but it's still fascinating to see how superheroes get interpreted in other countries. The United States has Spider-Man and Batman and the big names that are globally popular, but that doesn't mean that other countries have their own cultural heritages they're going to overlook when they take on the mantle of superhero.